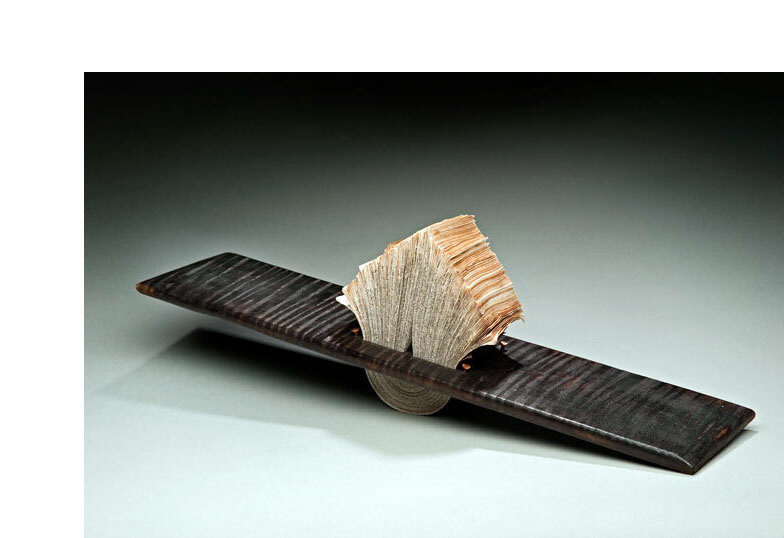 Major Works by Leading Artists, Masters Book Arts: "Blurring boundaries and defying categorization, Daniel Essig is a sculptor, painter, and woodworker whose allegiance as an artist lies with the book. Like artifacts from antiquity, Essig's works feel monumental in their complexity. To make his remarkable assemblages, he incorporates a multitude of components, including mica, nails, shells, old gears, and thorns. These comprise what Essig calls visual diaries — collections of found objects, and totems of memory that ultimately honor the importance of the book. "Nuanced with shallow textures, carved, painted, and layered, Essig's sublime surfaces appear softened by time. 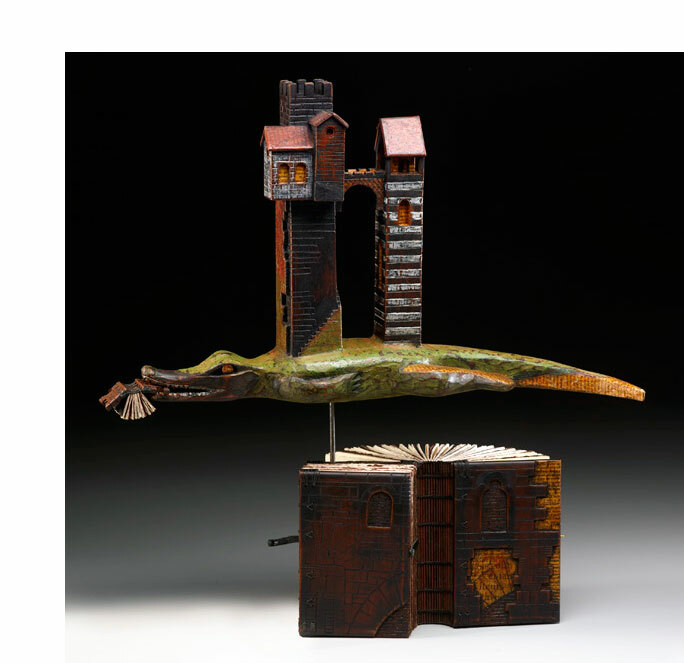 His unforgettable pieces challenge traditional ideas abut the medium as they straddle the line between book and sculpture." Asheville, North Carolina: Daniel Essig, 2016. One-of-a-kind. 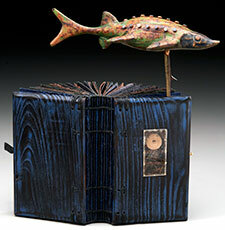 9 x 9 x 6" sculptural piece includes book and carved sturgeon. Materials: burnt and painted mulberry and locust, mica, nails, fossil, locust thorn, handmade paper. Book 3.25 x 5.5" with Ethiopian and Coptic bindings. Front board with window displaying found items. Leather and metal closure. Signed and dated by the artist. 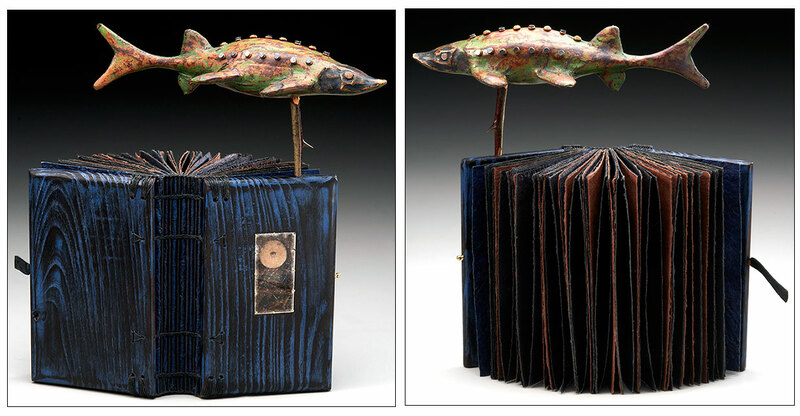 Daniel Essig: "Part of a series of sculptural books addressing my most passionate interests — collecting and studying freshwater fish. As a high school student, I worked at a retail aquarium. As a photography major in college, I joined biology graduate students on their research trips to rivers across the Midwest, taking photographs of their finds." Daniel Essig: "Dolph Smith helped push me beyond the simple Ethiopian book. He was making sculptural books by hanging paper from wooden structures, and I tracked him down and ultimately studied with him. Under his influence, I developed my bridge books, which use the same Coptic binding but exaggerate each of the elements: the covers become elongated into two-foot-long towers that stand on a tabletop, and rather than 10 or 12 signatures in the text block, I use 100 to 200, well over 1000 pages. I can’t afford that much new paper, so to make the bridges I return to the idea of the altered book. I find books that have mangled spines and covers but good quality paper, and I use that paper in my work. Often I use old Bibles with exceptionally thin paper, which has a nice drape and flow. I like to listen to bookbinders try to justify tearing up old books, because it sometimes makes them feel a little guilty. I don’t have much of a problem with the practice, because the books I alter are not rare, and they’ve already lived their lives. Bookbinders have been recycling books for 2000 years. In some of the first Coptic books, wood was scarce, and the binders would take old papyrus scrolls and laminate many layers together to make thick book covers." Asheville, North Carolina: Daniel Essig, 1997. One-of-a-kind. 22 x 9 x 3.25" bridge book. Materials: painted wood, handmade kozo and iris paper, mica, crinoid fossils. Centipede binding. Signed and dated by the artist. Graeme Priddle is a wood artist based in New Zealand. He worked in Essig's studio in Asheville, North Carolina, for a few weeks during 2015. Graeme Priddle: "I have always felt a natural affinity with wood and after twelve years working as radio technician I felt the need to do something more creative with my life. Originally I was drawn towards 'free-form' furniture as our bush block is littered with deadfall timber, the leftovers from the Kauri logging days of the early 1900′s. In 1990, the New Zealand economy became very depressed there was a limited market for original hand-crafted furniture. Fortunately, at that time I met a group of very creative woodturners and realised that there are endless creative possibilities to lathe work. "Major influences in my designs come from my natural surroundings, especially the sea and coastal environments, dreams and life experiences." Priddle works in wood applying "surface embellishments focusing on pyrographic branding and carving to create surface textures." Miniature: 2.4 x 2.8 x 1.5"; 13 sections of black paper leaves. Carved and painted maple, handmade paper, ammonite fossil. Exposed Coptic binding with leather strap and pin closure. Dated. Signed by the artists. A collaborative work by Daniel Essig, Graeme Priddle and Melissa Engler. Graeme Priddle is a wood artist originally based in New Zealand. He has collaborated with Essig on other work. Melissa Engler is an artist based in Asheville, North Carolina. 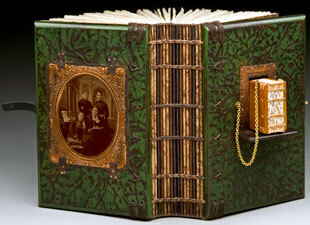 She has worked on previous collaborations with book binder and artist Daniel Essig. Priddle and Engler (husband and wife) co-teach at Penland. The boards of maple wood bear an ammonite pattern. The front board has a window housing an ammonite fossil. The swirling of the pattern on the boards reflects the swirl of the ammonite within the window. Asheville, North Carolina: Daniel Essig, 2015. One-of-a-kind. 4 x 5 x 2.5"; 16 sections, multiple pages. Materials: maple, ammonite fossil, mica, handmade walnut dyed flax paper. 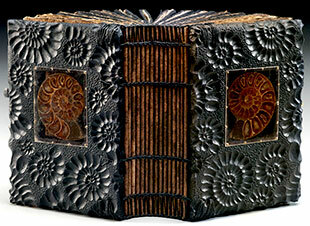 Bound in carved wooden boards of burnt and painted ammonite patterns. Exposed Coptic and Ethiopian bindings with leather strap and pin closure. Dated. Signed by both artists. The wooden boards of maple bear an ammonite pattern that has been carved, burnt, and painted. On each board there is a window housing an ammonite fossil. The swirling of the pattern on the boards reflects the swirl of the ammonite within the windows. Asheville, North Carolina: Daniel Essig, 2011. One-of-a-kind. 4 x 6 x 2"; 128 leaves. Endpapers of walnut-stained handmade flax paper. Other materials: mahogany, milk paint, Italian handmade paper, linen thread, brass, leather, mica, found metal, photographs. Leather strap closure. 1 x 1.5 x .5" miniature book with 60 leaves of paper handmade by Essig is attached by a chain to the front cover. It slips into a notched recess and sits on a metal shelf. Within the recess back wall is a photo presented in an oval frame of two people (one of which is obscured) holding a book. Endpapers recycled book pages with French text. Exposed coptic binding with wooden boards. Small window in front board covered with mica contains tiny shells. On the outside of the back cover of the host book is an old photograph (c. late 19th-century) of four women with open books in hand. On the inside of the back cover in the corresponding position is a mica-covered recess containing a rock with a simple botanical drawing. Daniel Essig: "Until fairly recently all books were prized possessions — medieval libraries chained books to the shelves to prevent theft. In those days each volume was crafted with precision, elaborately decorated and embellished with precious stones and metals. I aim to make my books just as precious as those medieval manuscripts." Miniature: 1.5 x 2.5 x 1.5"; 11 sections of black paper leaves with hand marbled paper leaf separating each section. Materials: maple, snake bone, mica, hand marbled paper. Bound in carved wooden boards of maple. Exposed Coptic binding with leather strap and pin closure. Dated. Signed by both artists. 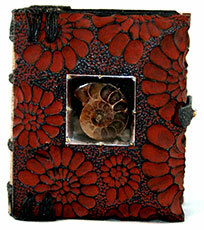 A miniature book with boards of white carved ammonites. In the middle of the front board is a window housing a snake bone. The swirling of the carved ammonites is reflected in the white and gray marbled papers interspersed in the interior pages of black paper. Asheville, North Carolina: Daniel Essig. One-of-a-kind. 18 x 4 x 5.5" sculptural piece. 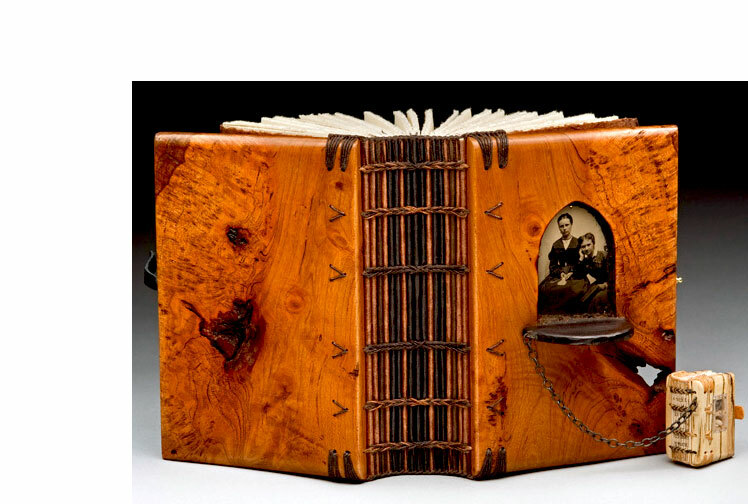 Board of curly maple with rectangular opening containing pages of folded 1800s text paper. Other materials: linen thread, copper nails. Daniel Essig: "I find books that have mangled spines and covers but good quality paper, and I use that paper in my work. ... One of my favorite things about bookbinders is listening to them justify tearing up old books. I don't have much of a problem with this, because the books I alter are not rare, and they've lived their lives. Book binders have been recycling books for 2,000 years." Three-piece sculptural work. Pen: 13 x 3", wood and metal pen nib. 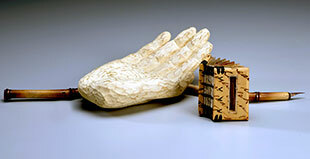 Hand: 6.25 x 4 x 2"; carved wood. Book: 1.5 x 2"; 18 pages plus free end pages, wooden boards, coptic binding, inset on front board with pen nib, calligraphy across boards. Signed both by artists. Daniel Essig: "Kim is my friend and studio assistant here in Asheville. Kim was a star student of mine when I taught for the University of Georgia study abroad program in Cortona Italy a few years ago. Kim is a print maker and book artist. 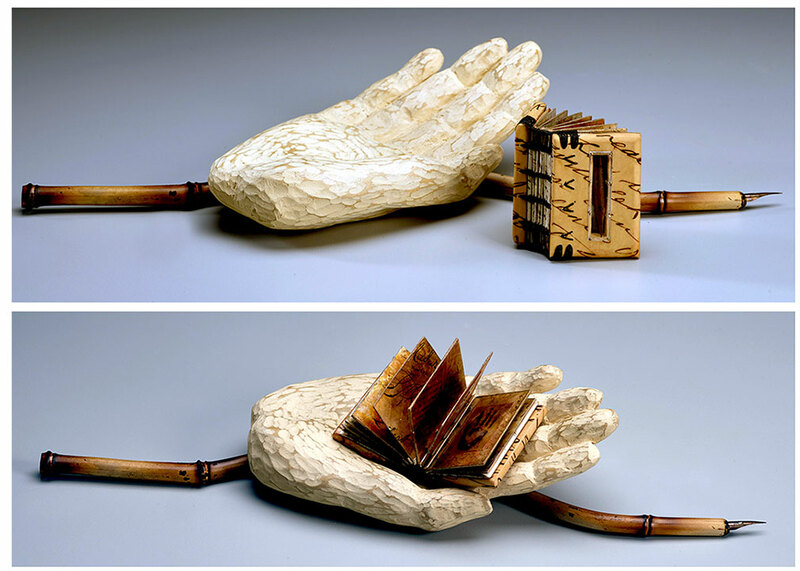 "In Bi Hand Kim carved the wooden hand, I made the pen and we collaborated on the book. "We made this piece for a calligraphy conference [A Show of Hands 2016] that was held here in Asheville." Asheville, North Carolina: Daniel Essig, 2010. One-of-a-kind. 15 x 11 x 6" wooden bird-like sculpture. 1 x 1.5" miniature book attached by chain to mouth. Materials: carved and painted mahogany, yew wood, mica, nails, handmade paper, tintypes, bones. Ethiopian and Coptic bindings. Signed and dated in the miniature book. Daniel Essig, interview Penland School of Crafts: "All my work has a Coptic book at its heart. The binding was first used about the fourth century, in Ethiopia or North Africa, or perhaps this is just the area where the books were best preserved. There are several distinct sewings known as Coptic. The style I use is known as Ethiopian. I use two needles for each length of thread, one on either end. I use wood covers and tunnel through the edge of the board to attach the text block. The historic sewing style, wooden boards, and the type of board attachment are what distinguish the Ethiopian style Coptic Binding." 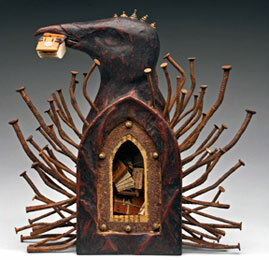 Bibliophile is a sculpture with a miniature book tucked away in the mouth of the scavenger, salvager, or savior – animal/beast. Essig sees books as prized possessions thus the chain to prevent the little book from slipping away – a homage to the time when libraries needed to chain books in order to prevent theft. 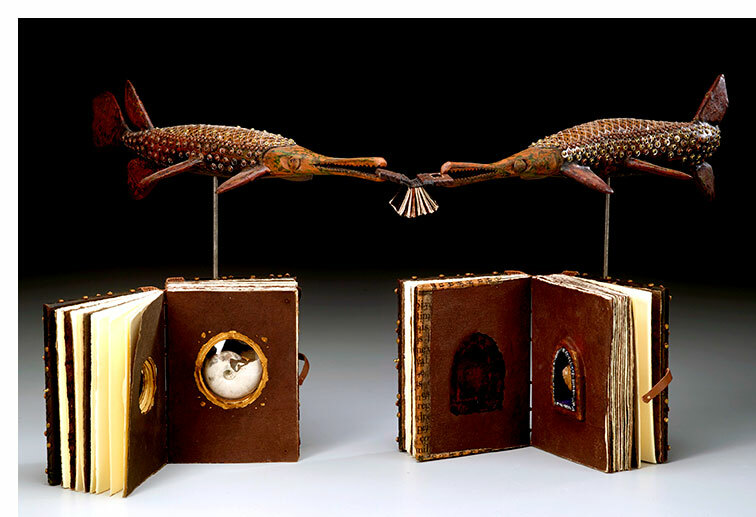 There are also photos on each side of the animal sculpture showing readers – homage to the traditional book, readers, and reading in an untraditional way? 9.5" X 12" x 16" open; 7.5" x 12" x 18" closed. Closed, this piece resembles a sort of a large, aberrant sea urchin that has nails instead of spines and rests on several elongated nail-legs. 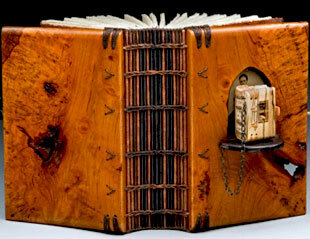 The "urchin body" is a book of thick wooden boards with a sewn Ethiopian binding. These 'leg' nails come from both boards of the book, so that when open the book rests on the longer nails coming from both boards. 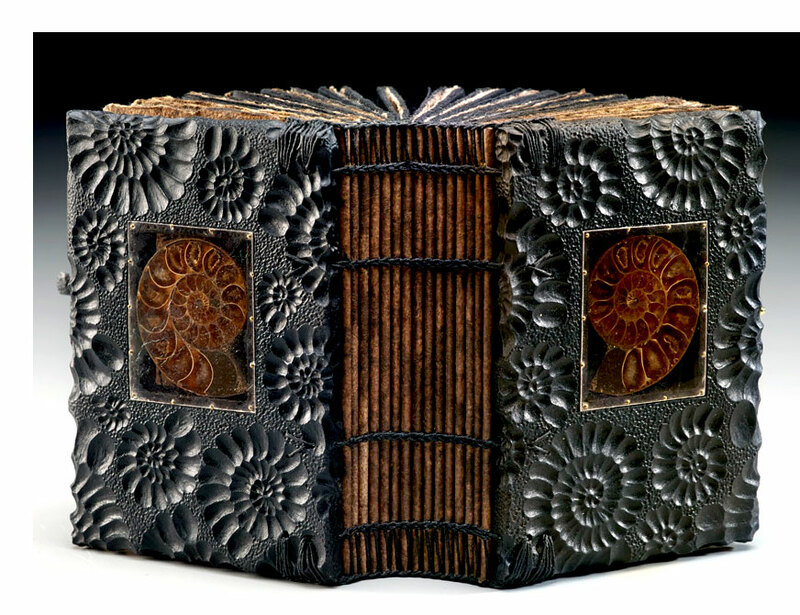 Open, the boards of this nail book turn out to be two carved and painted mahogany boxes attached by a sewn Ethiopian spine. 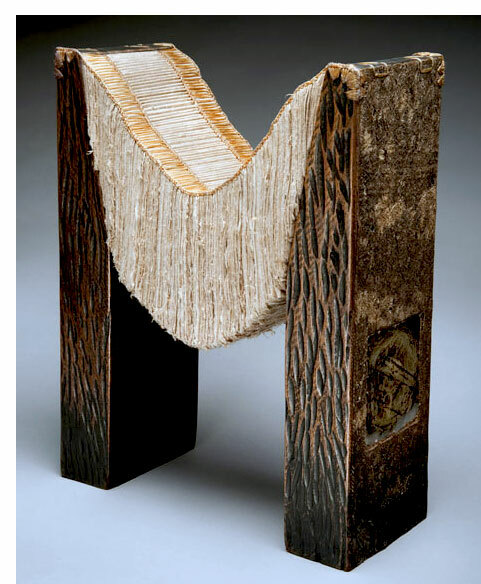 This spine is constructed of small sections of handmade paper. In one of the boards/boxes/sides of the nail book are two cavities, each containing a miniature book held in place by chains; in the other is a cavity containing a fulgurite tube behind mica. Materials: mahogany, various metals, handmade flax paper, fulgurite, velvet, linen thread, handmade paper, mica, paint, leather, stains, and epoxy. Sculpture? Reliquary? Fetish? Book object? Art? Daniel Essig's work. "The piece is designed to stay open, but book can be closed. Two miniature books are chained to larger book. The larger book of nails is constructed out of oak; the small books are made from an oak scrap from a medieval castle given to me by Jim Croft. "The object on the left is a fulgarite tube created when lightning hits a beach or desert; the small books have positive/negative board attachments, the darker book is charred. The upper miniature book holds a piece of loadstone which is naturally magnetic; the lower book contains a piece of amber." 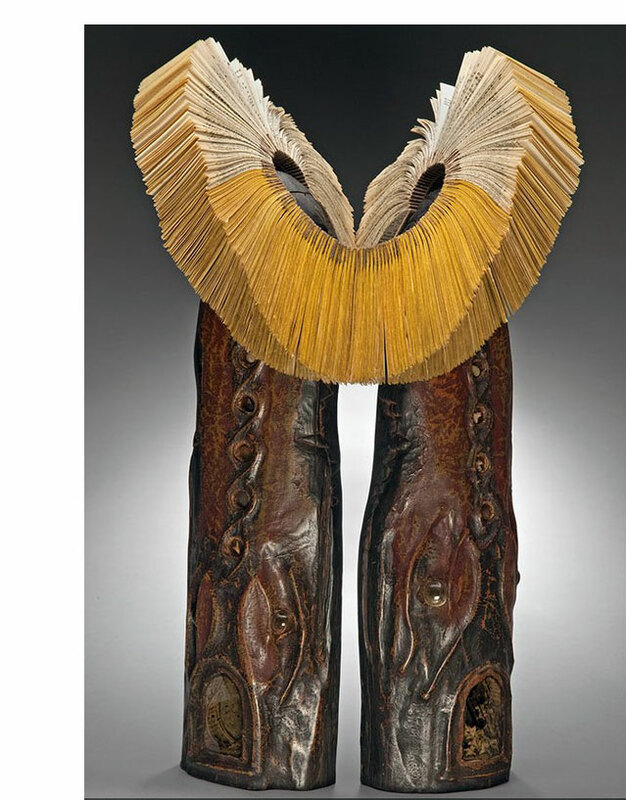 In an interview published in Express Milwaukee Essig was asked about his inspiration his sculptural forms: "Mainly from the Kongo culture in Africa. They’re a very positive and healing form, and the nails driven into them evoke the figure, whether actual sculptures or a book form. In this particular culture when there’s a disagreement the people go to an elder, they discuss it, and then make a decision. When the decision is made, they pound or strike a nail into the figure, to heal the argument and signal it’s final. So they’re basically healing in nature, which are represented by the nails I use in other sculptures, that are usually found objects or reused." Asheville, North Carolina: 2009, Daniel Essig. One-of-a-kind. 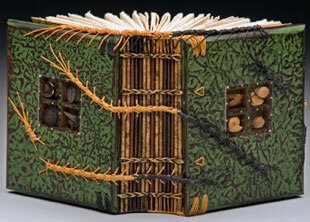 9 x 9 x 2.5" structure with miniature books and miniature scrolls. Materials: yew, mahogany, handmade paper, milk paint, nails, mica, tin. Accordion and Ethiopian bindings. 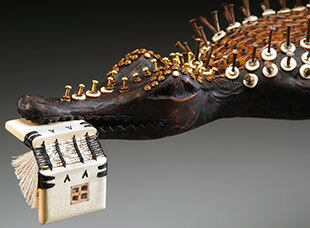 Daniel Essig: "N'kisi nkondi nail figures – wooden sculptures made by the Kongo peoples of central Africa – served to protect villages, cure illnesses, and settle disputes. In my interpretations of these figures, I see the nails as a form of defense – they protect the tiny book at the center of the sculpture." 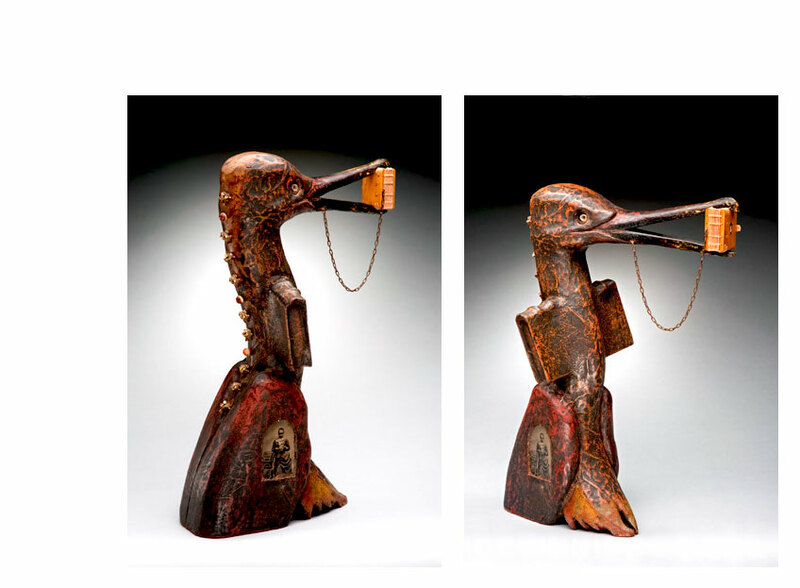 The composure of this serene bird – miniature book in its beak, body pierced by rusty nails, heart a reliquary of tiny books and scrolls – combines mystery, power, and threat. Asheville, North Carolina: Daniel Essig, 2003. One-of-a-kind. 5 x 4 x 2.5", 132 leaves. Materials: mahogany, milk paint, walnut-stained handmade flax paper, Italian handmade paper, linen thread, brass, leather, mica, fossils. Endpages of walnut-stained handmade flax paper. Greek and centipede exposed binding. Four-pane shadow box insert in front cover. Leather strap closure. A blank book with handmade paper and a unique binding. The centipede binding is an Essig invention. "Since I was six or seven years old, I've been collecting small objects. I have seashells that I collected at the beach on childhood vacations, dried sea horses, starfish, and mineral collections that I bought at gift shops. ... I keep my collection of objects in various cabinets, drawers, bottles, and boxes within a single small room in my house. The space has the feel of a German Wunderkammern, a 'cabinet of curiosity.' I sit in the room and scan my collection for just the right object for each of my books and sculptures." 4 x 5.9 x 2.5"; 136 leaves. Boards of natural cherry and spalted maple. Endpapers of walnut-stained handmade flax paper. Miniature book sits on a rounded shelf extending from a narrow recess in the middle of the front board. Within the recess back wall is a photo of two women, one of whom is holding a book. Exposed coptic binding with boards of found wood. Other materials: Italian handmade paper, linen thread, brass, leather, mica, found metal, photographs. Leather strap closure. 1 x 1.5 x .75" miniature book with 60 leaves of paper handmade by Essig is attached by a chain to the front cover. Two-paned window in front board covered with mica contains tiny shells. Bound with wooden boards and exposed Coptic binding. Daniel Essig: "Until fairly recently all books were prized possessions — medieval libraries chained books to the shelves to prevent theft. In those days each volume was crafted with precision, elaborately decorated and embellished with precious stones and metals. I aim to make my books just as precious as those medieval manuscripts. Asheville, North Carolina: 2009 - 2011, Daniel Essig. One-of-a-kind. 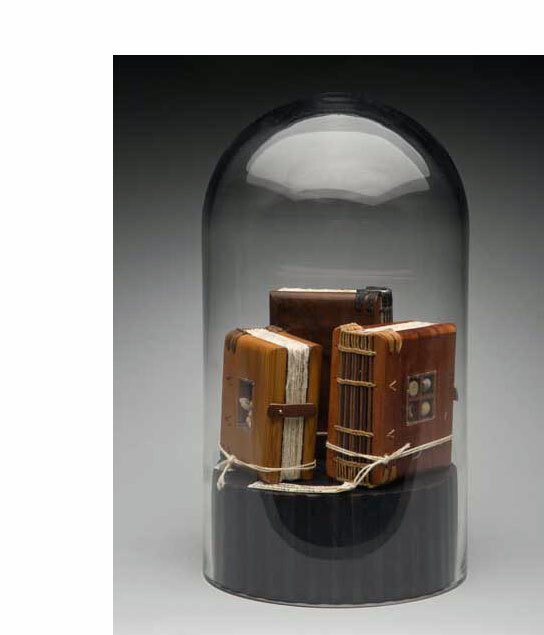 Assemblage: 3 books, glass dome, wooden base. Glass dome: 9.5" height, 5" diameter. Wooden Base: 2" height, 5" diameter. Three books sit on the wooden base under the glass dome. Handwritten paper tag on each book. The collection of books (all with blank pages) under the dome have bindings made by Essig from wood sent to him by friends. 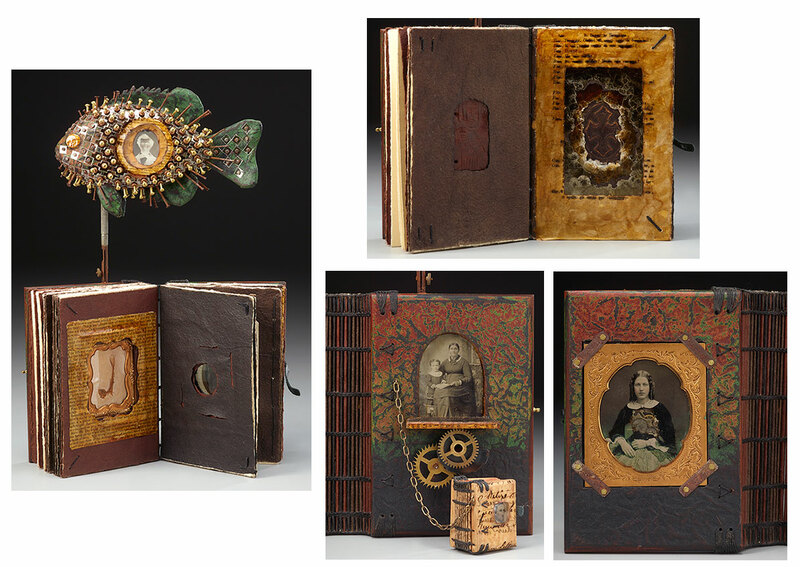 The niches in each book contain found objects from Essig's collections. Daniel Essig: "I don't write in my books. For me, the books themselves are journals – visual records of my life and work. 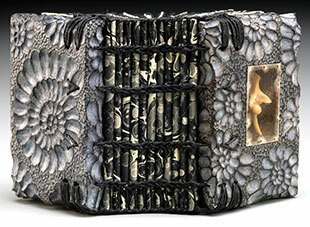 I am interested in traces of the past – ancient binding styles, altered books, distressed finishes, and found objects." Book 1: 2 x 2.7 x 1"; 58 leaves plus end pages. Niche with see through cover in backboard containing seashells. Ethiopian binding with wooden boards made from wood scrap received in 2008 from Jim Croft, bookbinder. Leather and metal pin closure. Book 2: 2.5 x 2.9 x 1.25"; 60 leaves plus end pages. 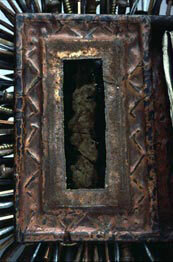 Four-quadrant niche with see-through cover in back board contains bones, crinoids, shell, and stone. Ethiopian binding with wooden boards made from wood scrap received in 2011 from Frank Wiesner, wood worker. Leather and metal pin closure. Book 3: 2.25 x 3.5 x 1"; 54 leaves plus end pages. Split niche with see-through cover on front board with ammonite and trilobite. Ethiopian binding with wooden boards made from wood scrap received in 2009 from Stoney Lamar, wood turner. Asheville, North Carolina: 2014, Daniel Essig. One-of-a-kind. 9.5 x 16 x 4.5" sculptural bookwork. Materials: curly maple, holly, poplar, mica, shellac, 1800s text paper, handmade paper, milk paint, and waxed linen thread. Base is a blank book with wooden boards. Fossil window in front board. 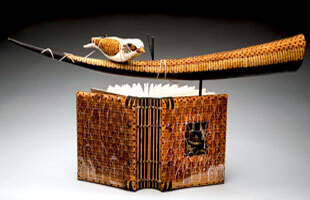 Rod extends vertically from book's front board supporting a horn-shaped sculpture and an attached carved wooden bird. Old text paper on book covers, running down the horn-shaped sculpture, and on the bird (eyes, wings, and ventral strip). Signed by both artists. endangered, a collaboration between artists Daniel Essig and Melissa Engler, was created for an exhibition "Hunted and Gathered." The bird attached by a chord on Engler's horn-shaped sculpture has a magnet that allows it to rest firmly atop the horn. But by means of a cord wrapped around the horn and the bird (suggesting strangling and connection) the bird can also be positioned to dangle from the horn. Hence, the bird can be displayed atop the horn (the endangered position) or dangling from the horn (the extinct position). Melissa Engler: "[The pieces] are an exploration into the ways we utilize the natural world with an emphasis on the line between use and abuse. I am deeply interested in conservation and the sacred quality of plants and animals. Simultaneously I am fascinated by the cycles of consumption and violence that are inherent in natural systems. Being that these two concepts are somewhat at odds with each other, I feel compelled to create work that allows me to examine these concerns without having to find words or perfect answers. My hope is that the pieces convey a sense of our primal connection to our environment and evoke an awareness of its tenuous state." Asheville, North Carolina: Daniel Essig, 2013. One-of-a-kind. 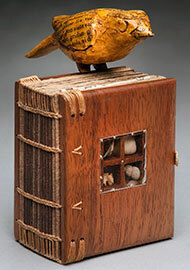 4.25 x 3.5 x 2.5" sculpture with carved bird atop book. Materials: holly, koa, handmade paper, mica, fossils, shell, feather, ambrotype, leather, brass. 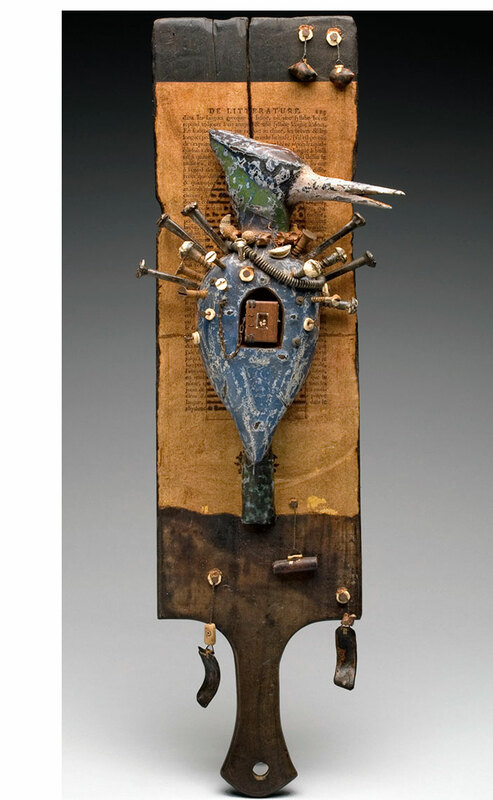 Carved bird: 3.75 x 1.25 x 1.25" painted and covered in recycled fragments of text pages. 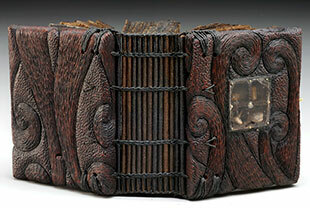 Book: 2.5 x 3 x 2" bound in wooden boards; exposed Ethiopian and coptic stitching; leather and nail closure. Front board of book has a 4-section pane housing fossils and shells. Interior of book: page with image of woman with book on recto and feather with mica on reverse; shadow box with vertebrate; two sections of blank pages. Signed and dated by the artist on the last page of the book. 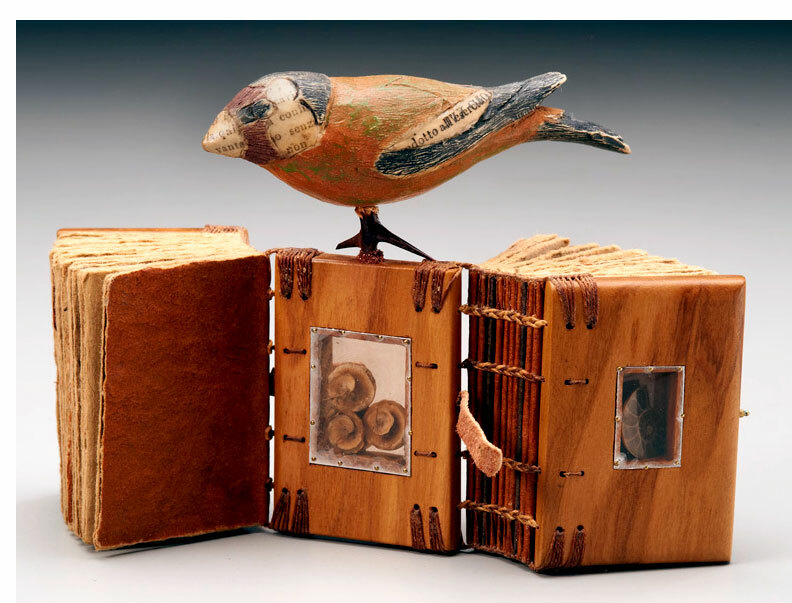 Daniel Essig: "Fetish-bird is the latest in my wooden book series: altered books. 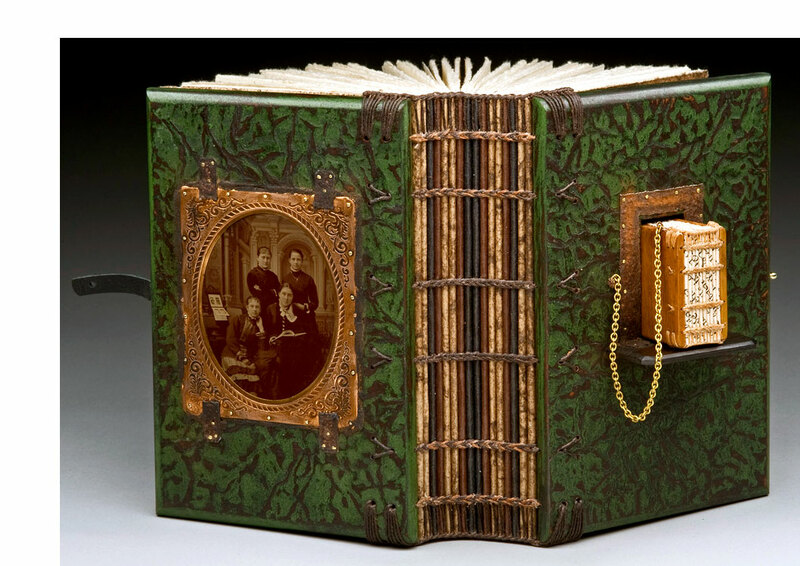 After the wooden book is completely bound with main sewing and end band, I cut back into the structure creating niches and alcoves to house objects and photographs. I carve a small creature/fetish to keep watch over the book." Asheville, North Carolina: Daniel Essig. 2014. One-of-a-kind. 5.25 x 7 x 2.5" sculptural bookwork. Materials: Holly, koi, handmade paper, leather, brass, mica, fossils, bones, shells, and tintypes. Base is a book with a dos-à-dos binding. Wooden boards with leather strap and pin closures. Ethiopian and Coptic bindings. End boards with four-pane window containing fossils, bones, and shells. Both books with interior 'box' of pages. Tintypes on back page. Interior houses shells and fossils. Rod extends from top of middle board with carved wooden gar. Pieces of text on fins, tail, and snout. 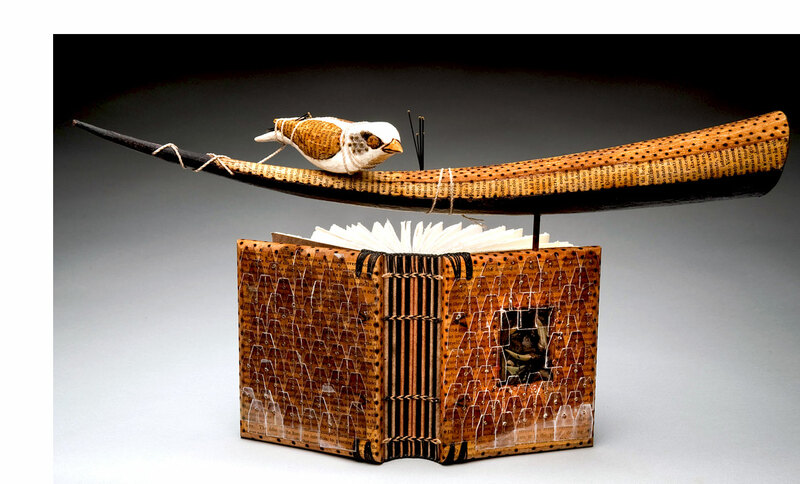 Daniel Essig: "[My current body of work is] hand-carved animals that are book based or house a miniature wooden Ethiopian binding. Many of the sculptures depict birds or fish. Currently I am carving and exploring crocodiles often with boat and bird combinations. 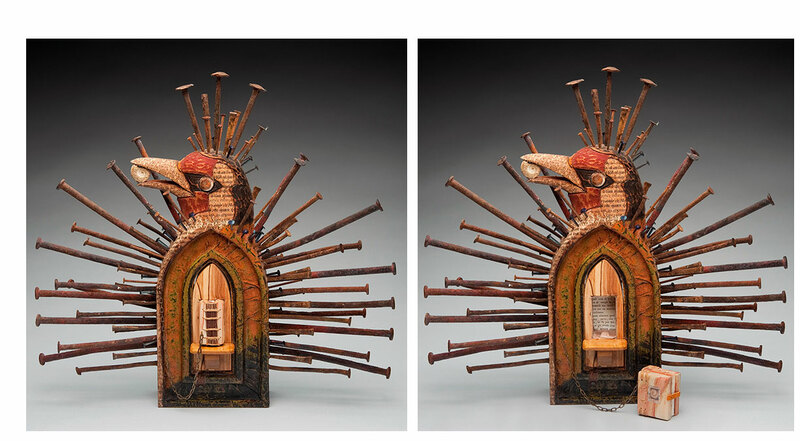 Themes of journey, vessels, travel, protection, reverence, fate, and prophecy fill these pieces." 12.5 x 12 x 1.5" sculpture. Hand carved and painted mahogany, holly, handmade paper, mica, shellac, nails, 18th- and 19th-century text pages, ambrotypes, tintype, watch crystals, antique gears, fossils, bones and other relics. Ethiopian and Coptic bindings. 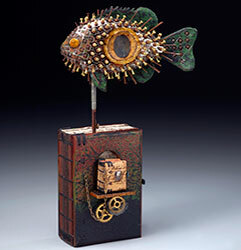 Daniel Essig: "Fish-Eye is part of a series of sculptural books addressing my most passionate interests—collecting and studying freshwater fish. As a high school student, I worked at a retail aquarium. As a photography major in college, I joined biology graduate students on their research trips to rivers across the Midwest, taking photographs of their finds. "Photography led me to books: Initially I planned to make handmade paper, print my images, and then bind them into a book. I never achieved that goal, but pursuing it exposed me to the joys of bookmaking—especially to the wooden Ethiopian/Coptic book structure. "Fish Eye —references a camera lens that produces a distorted view—brings together my passions for fish and books. With ambrotypes, antique gears, and watch crystals, the piece explores the fascinating ways that time reshapes our vision." Asheville, North Carolina: Daniel Essig, 2014. One-of-a-kind. 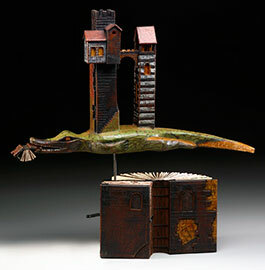 20 x 19 x 7" crocodile-shaped sculpture supporting 2 tower-like structures attached by a bridge on its back and a miniature book in its mouth. The crocodile rests on a support pole anchored in a dos-à-dos book covered in carved wooden boards and containing handmade paper and attached hollowed sections filled with rocks. Materials: carved and painted mahogany, milk paint, mica, shellac, nails, handmade paper. Signed and dated in the miniature book. Daniel Essig: "Gubbio was inspired by Tuscany hill top towns during my semester teaching for University of Georgia." Gubbio is a medieval hill town in the Umbria region of central Italy. Asheville, North Carolina: 2008, Daniel Essig. One-of-a-kind. 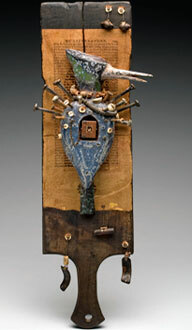 20 x 7 x 5" assemblage with miniature book on chain. To be wall mounted. Materials: mahogany, cherry, handmade paper, antique text paper, milk paint, nails, mica, shells. Processes: carving, burning, painting. Ethiopian binding. American Style Magazine, December 2007: "You will not find any of Daniel Essig’s books on the shelves of a library. 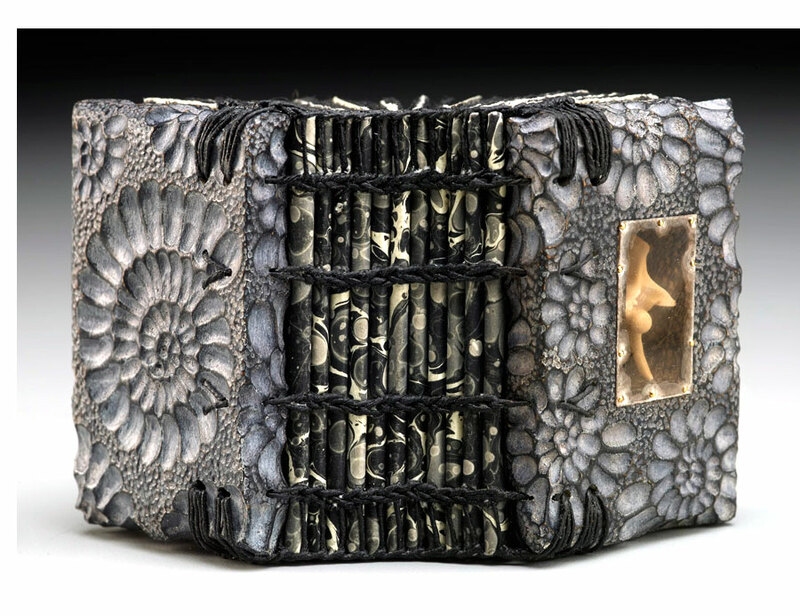 These wordless works of art are sewn, woven, and carved into magnificent artists’ books and sculptures. Formerly a photographer, Essig is inspired by found objects that he comes across every day. 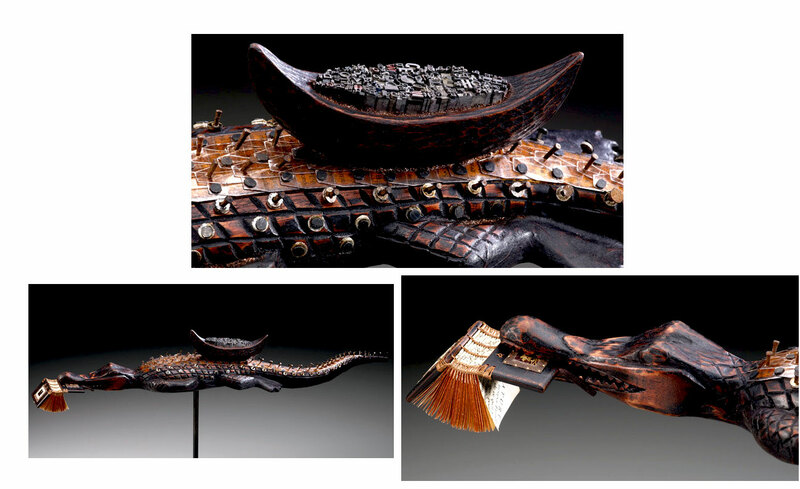 A self-described hoarder, he will incorporate these items—fossils, shells, coins and old nails—into his artwork"
Horn Book – Fisher is a combination horn book (with its allusions to law and learning) and n'kisi nkondi (a Central African nail fetish which in Essig's iconography connotes protection) with overtones of the import and at risk nature of the book. 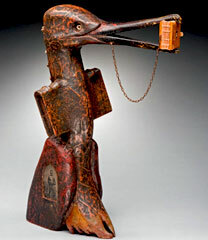 There is a paddle on which is collaged a page of found text (excerpt from an uncited French text on literature); there is a 3-dimensonal Fisher bird of painted wood about a foot tall, it's body pierced with nails and screws; there is miniature book with Ethiopian binding chained to the bird's body and resting in a cavity of its belly. 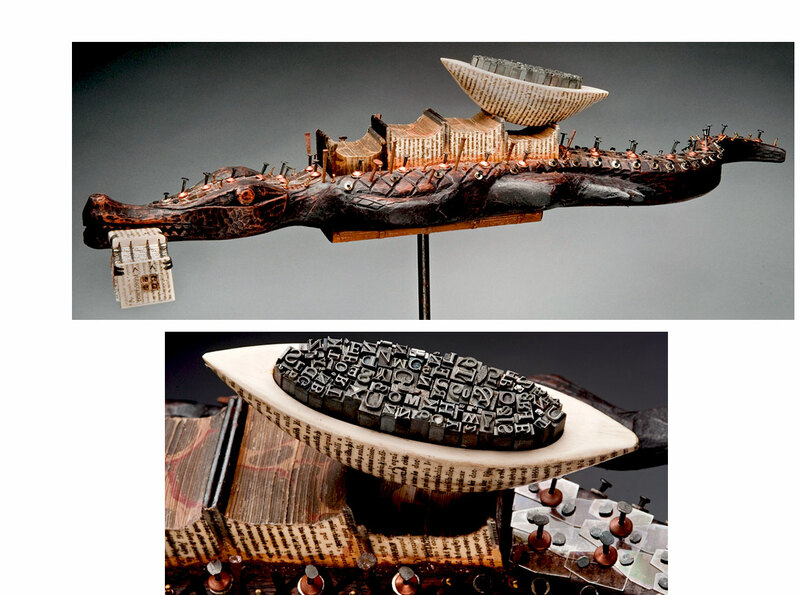 This assemblage brings together several of Essig's inspirations — ancient binding, history, N'kisi nkondi nail figures, chained books, and cabinets of curiosity. Fetish? Totem? Art? Yes, we think. 9.25 x 7 x 2.5" sculptural piece. Materials: holly, mahogany, milk paint, handmade paper, mica, printers type. Ethiopian and Coptic bindings. MountainXpress, Group dynamics, February 4, 2014: "Essig’s current body of work takes inspiration from a semester of teaching in Italy. In the paintings he saw during his travels and while reviewing his photographs following the trip, he noticed the recurring appearance of a small, red-faced songbird. 'An Internet search revealed the bird symbolized "prophecy,"' he says. 'These pieces that contain the European goldfinch, a hand-bound book and lead type, are statements about the future of the book.'" Miniature: 2.5 x 3 x 2"; 22 leaves and shadow box. Materials: apricot wood, fossils, mica, handmade papers. Bound in carved boards of apricot wood. Exposed Coptic binding with leather strap and pin closure. Dated. Signed by both artists. 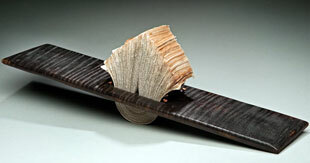 The pattern of the carved boards is a spiral shape based on the shape of the new unfurling growth of a fiddlehead fern. It is a symbol traditionally used to decorate Maori meeting houses. In this miniature presentation the koru pattern is carved and burnt into the boards. 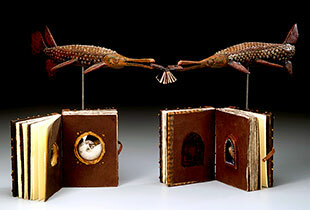 33 x 13 x 8" Two crocodile sculptures of carved and painted mahogany holding a single miniature book in their mouths. Each crocodile atop metal rod held in place by 4.5 x 6 x 2.5" books. Other materials: mica, handmade paper, metal. Ethiopian and Coptic bindings. 1.5 x 1" miniature book held in the mouths of the two crocodiles. Handmade paper pages creating a blank book. Wooden boards with exposed Coptic binding. Single pane window on front board housing fossils. Signed and dated by the artist. 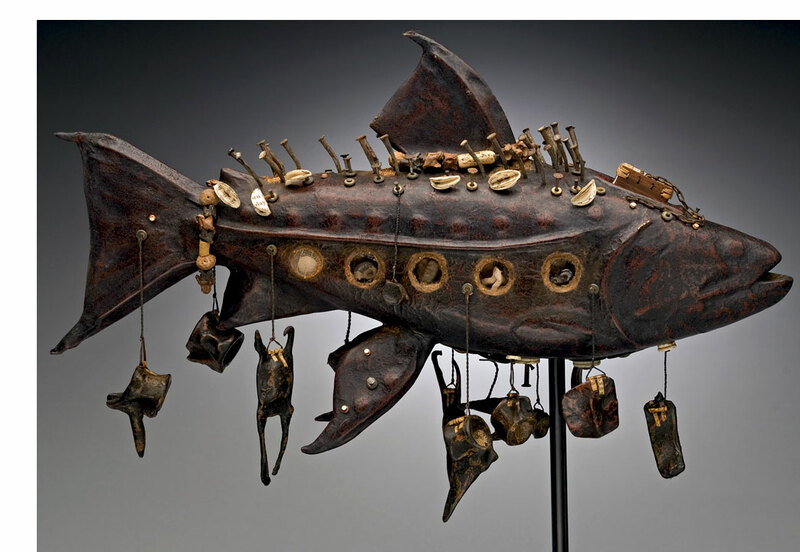 Adrienne Garnett, "Surface Tension: Poetry of the Ancients in Our Own Time," Art of the Times Vol 18 Summer 2012: "Daniel Essig’s book-based sculptures honor the ancients while slyly revealing artifice and making quantum leaps from antique to present time. 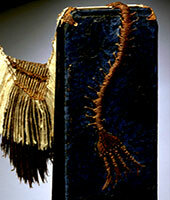 "Essig has mastered the techniques of a fourth-century book-binding style known as Ethiopian Coptic. 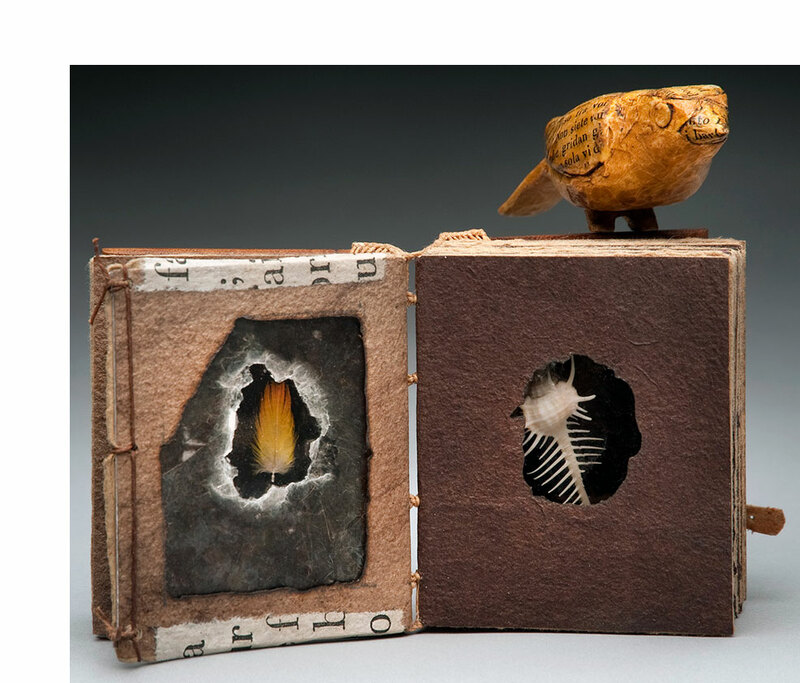 He creates mixed media book structures that incorporate unusual woods as covers, handmade paper, fossils, mica, and found objects. This mastery appears in many of his magical birds, fish, and reptiles as they clasp minibooks firmly-yet-delicately in their beaks or bear books interred in their backs or hanging symbiotically from their sides. The microcosmic detail ... is absolutely titillating." 12 x 16 x 3.5" assemblage with metal stand. Materials: mahogany, handmade paper, milk paint, mica, nails, fossils, and bones. Carved. 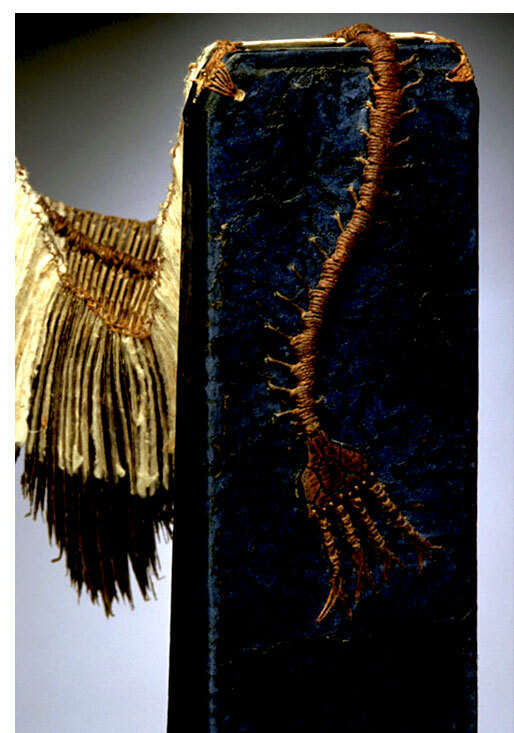 Ethiopian binding. 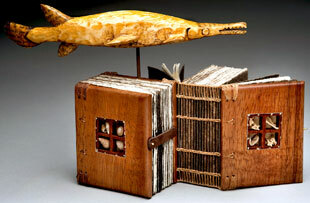 A sculptural book in the form of a life-sized trout. Shaped much like Captain Nemo's Nautilus, this trout has portholes allowing glimpses of seemingly sacred objects. A collection of charms hangs from the body. A chained miniature book bound in an ancient style fits snuggly in the trout's forehead. Daniel Essig, interview in Express Milwaukee.com: "Often my figures and books have miniature windows in them, covered with natural mica, that contain bones or natural objects I have collected for years. 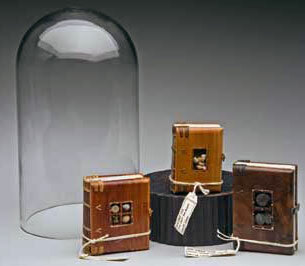 These resemble reliquaries, and may even have more miniature books inside them, or around the sculpture, or in the animal’s mouth, and then could be chained to the sculpture. Historically, books were chained to library shelves, and I do this to relate how precious books are. I use Irish waxed linen and steel needles to do the bindings. The sculptures ... may be titled Bricolage, a collage of ideas with what you have on hand." 26 x 10 x 4" sculpture. 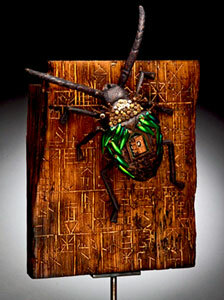 Carved, painted, and burnt wood with mica, nails, handmade paper, found natural objects, and beetle shells. 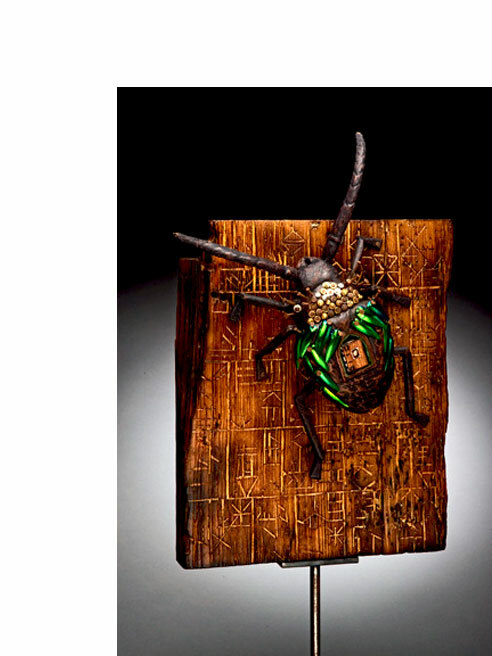 Beetle mounted on carved wood board. Miniature book in niche on back of beetle. Miniature book: 75 x 1"; 32 leaves. Wooden boards with exposed sewn binding. Leather strap closure. Shell in niche on front board. Free end pages recycled text pages. Time Travelers Exhibit, Asheville Bookworks: "Asheville artist Daniel Essig’s piece gives us not only an historical book structure but also a sculptural setting to house the book. His innovative interpretation of book structure and aesthetics give the work a look and feel of age and history and it is only fitting that it holds a book whose sewing structure dates back to the 4th century." 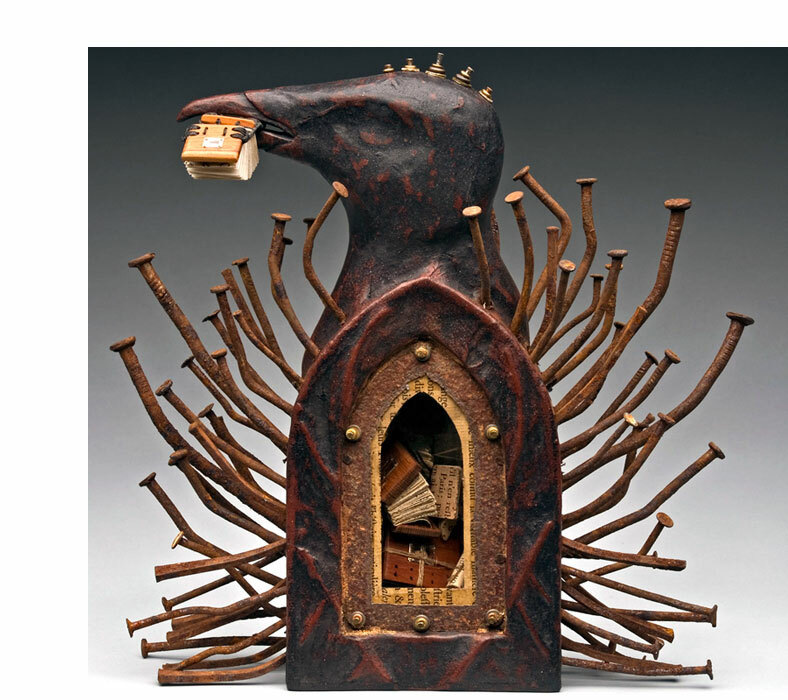 Masters Book Arts: Major Works by Leading Artists: "Blurring boundaries and defying categorization, Daniel Essig is a sculptor, painter, and woodworker whose allegiance as an artist lies with the book. Like artifacts from antiquity, Essig's works feel monumental in their complexity. 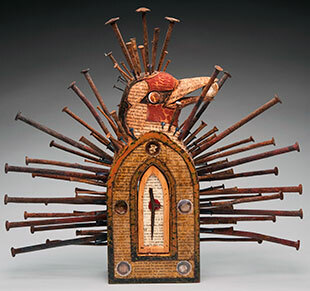 To make his remarkable assemblages, he incorporates a multitude of components, including mica, nails, shells, old gears, and thorns. These comprise what Essig calls visual diaries – collections of found objects and totems of memory that ultimately honor the importance of the book." 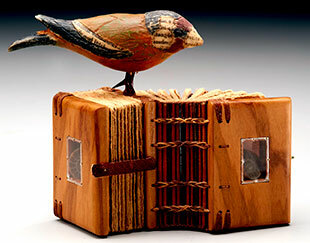 4.5 x 5 x 5" sculptural bookwork with carved bird. Dos-à-dos binding. Materials: carved and painted holly, Italian olive, handmade paper, mica. Wooden boards with leather strap and pin closures. Ethiopian and Coptic bindings. End boards with single pane window containing shell. Signed by the artist. MountainXpress, Group dynamics, February 4, 2014: "Essig’s current body of work takes inspiration from a semester of teaching in Italy. In the paintings he saw during his travels and while reviewing his photographs following the trip, he noticed the recurring appearance of a small, red-faced songbird. 'An Internet search revealed the bird symbolized "prophecy,"' he says. 'These pieces that contain the European goldfinch, a hand-bound book, and lead type, are statements about the future of the book.'" 13.75 x 15 x 4" book sculpture. Materials: box elder, Italian olive, mahogany, milk paint, nails, thorn, antique text pages, sealing wax, mica, fossil. Miniature book: 1.25 x 1.75", wooden boards, leather and nail closure, coptic and Ethiopian bindings. Signed and dated by the artist on the last page of the miniature book. Daniel Essig: "Sacred Geometry - Carduelis is an Italy-inspired work combined with my Sacred Geometry series. The European Goldfinch was frequently seen in Italian paintings and symbolized prophecy." Daniel Essig, The Penland Book of Handmade Books: "Sacred Geometry … draws inspiration from a number of sources, including medieval reliquaries and African nail figures, and as with all my work, it has an Ethiopian book at its heart. Rather than stretch the elements of the book … I make a fairly standard small book the centerpiece of a work of sculpture. "The most striking aspect of Sacred Geometry is the halo of nails, which I borrowed from n'kisi nkondi nail figures, wooden sculptures made by the Kongo peoples of central Africa and used for protecting the village, curing illnesses, and settling disputes. Inside a cavity in the figure's head or stomach were placed ritual substances, such as herbs, animal bones, fur, and seeds – a detail similar to my own use of found objects. 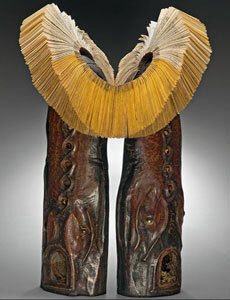 Each of the nails driven into a n'kisi figure represents one occasion when the power of the figure was invoked. "To me, the nails suggest a defense, like the quills of a porcupine. In medieval Europe, books were so rare and precious that they were chained to library shelves, and in some of my work I chain books, to suggest their preciousness. In Sacred Geometry, it is the nails that provide the protection." 30 x 16 x 9" sculpture. Materials: burnt yew wood, mica, quartz, relics, 1800s text papers, handmade papers. Ethiopian binding bridge book. Daniel Essig: "Dolph Smith [Professor Emeritus at Memphis College of Art where he instituted a Hand Papermaking and Book Arts program] helped push me beyond the simple Ethiopian book. He was making sculptural books by hanging paper from wooden structures, and I tracked him down and ultimately studied with him. Under his influence I developed my bridge books, which use the same Coptic binding but exaggerate each of the elements: the covers become elongated into two-foot-long towers that stand on a tabletop, and rather than 10 or 12 signatures in the text block, I use 100 to 200, well over 1000 pages. I can’t afford that much new paper, so to make the bridges I return to the idea of the altered book. I find books that have mangled spines and covers but good quality paper, and I use that paper in my work. Often I use old bibles with exceptionally thin paper, which has a nice drape and flow. I like to listen to bookbinders try to justify tearing up old books, because it sometimes makes them feel a little guilty. I don’t have much of a problem with the practice, because the books I alter are not rare, and they’ve already lived their lives. Bookbinders have been recycling books for 2000 years. In some of the first Coptic books, wood was scarce, and the binders would take old papyrus scrolls and laminate many layers together to make thick book covers." 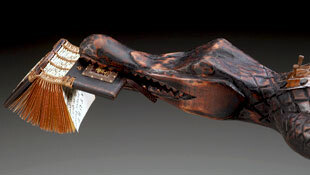 15 x 25 x 4.5" crocodile sculpture of carved and painted mahogany with miniature book in its mouth. Other materials: mica, nails, handmade paper, found natural objects, lead type. Ethiopian and coptic bindings. Miniature book: 1.5 x 2"; 74 leaves. Pages of found book cut into 1.5 x 2" sections. Some text but generally borders of the found pages creating a blank book. Wooden boards with exposed coptic binding. Four-compartment window on front board housing shells. Leather strap closure. Tin and leather layer on back board with gilt flower illustration. 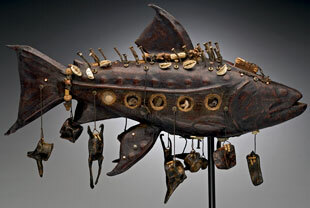 Adrienne Garnett, "Surface Tension: Poetry of the Ancients in Our Own Time," Art of the Times Vol 18 Summer 2012: "Daniel Essig’s book-based sculptures honor the ancients while slyly revealing artifice and making quantum leaps from antique to present time. Rusted and bent nails that are repurposed as millelegs of an ancient lumbering creature host a few shiny new screws. 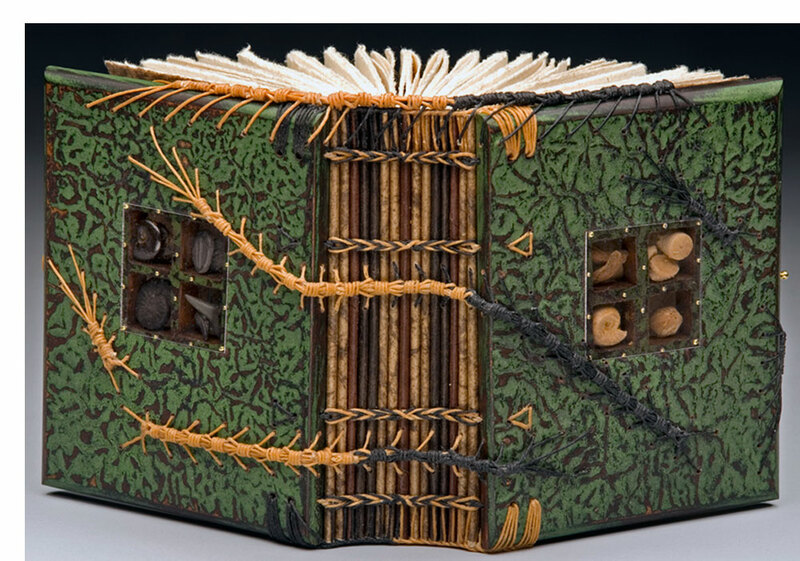 "Essig has mastered the techniques of a fourth-century book-binding style known as Ethiopian Coptic. 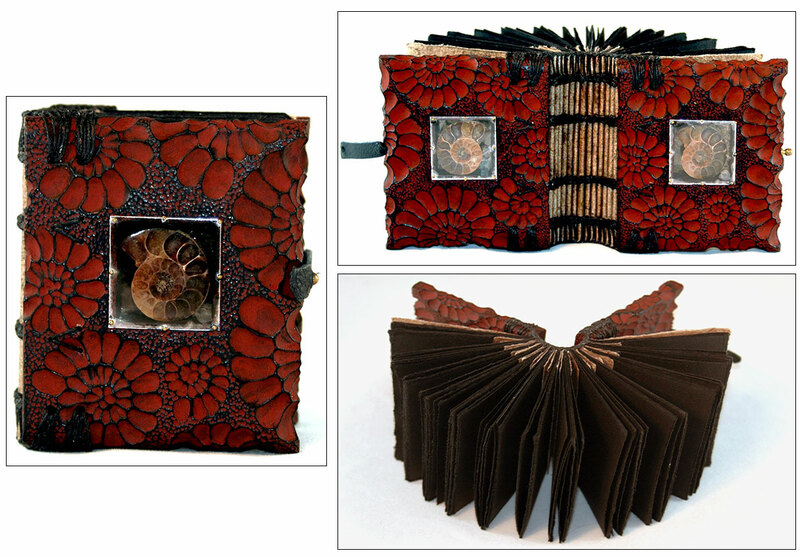 He creates mixed media book structures that incorporate unusual woods as covers, handmade paper, fossils, mica and found objects. This mastery appears in many of his magical birds, fish, and reptiles as they clasp minibooks firmly-yet-delicately in their beaks or bear books interred in their backs or hanging symbiotically from their sides. The microcosmic detail ... is absolutely titillating." 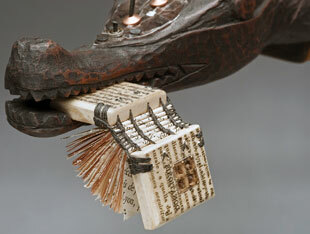 12 x 25.5 x 6" crocodile sculpture of carved and painted mahogany with miniature book in mouth. Supported on metal base with rod into underbelly of crocodile. Other materials: holly, mica, nails, handmade paper, found natural objects, lead printers type. Ethiopian and Coptic bindings. Miniature book: 1.5 x 2"; 74 leaves. Borders of found pages creating a blank book. Recycled text pages in binding and as end pages. Wooden boards with exposed Coptic binding. Four-compartment window on front board housing shells. Signed and dated by the artist. Eno Gallery: "The water's edge is source of inspiration for Daniel's book based sculptures, barely above or below the skin of the waterline." 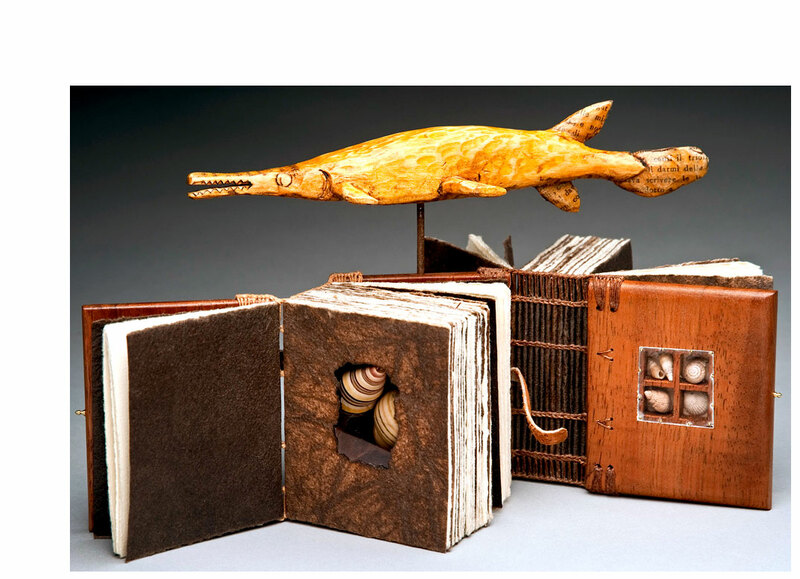 Daniel Essig: "[My current body of work includes] hand-carved animals that are book based or house a miniature wooden Ethiopian binding. Many of the sculptures depict birds or fish. Currently I am carving and exploring crocodiles often with boat and bird combinations. Themes of journey, vessels, travel, protection, reverence, fate, and prophecy fill these pieces." 16 x 24 x 6.5" crocodile-shaped sculpture of carved and painted mahogany. Miniature book in its mouth. Other materials: holly, milk paint, antique text, printers type, found book, mica, nails, fossils. Ethiopian and Coptic bindings. Daniel Essig: "When the very nature of the printed word is in question, can we expand the possibilities?"